Eyes are organs of vision that detect light. Which made the simplest eyes nothing more than knowing whether the surroundings are light or dark. More complex eyes are used to provide a visual understanding. • Eyelashes serves to filter the light to be received. • function eyebrows withstand sweat from getting into the eye. • The eyelids serve to cover and protect the eye. Is the outermost part of the eye that receives light from the light source. Is part of the white wall of the eye. The average thickness of 1 millimeter but irensi muscles, thickened to 3 millimeters. Of the cornea, the light will be forwarded to the pupil. Pupil determine the quantity of light entering the eye deeper. Pupils will dilate if a dark room conditions, and will narrow if the room light conditions. 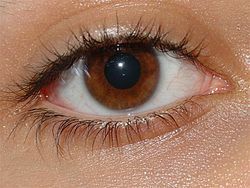 Width is influenced by the iris pupil at sekelilingnya.Iris serves as a diaphragm. Iris is seen as the colored part of the eye. The lens receives light from the pupil and pass them on to the retina. The function of the lens is set focus light, so the light falling directly on the retina yellow spots. To view a distant object (the light coming from far away), the lens will be depleted. Meanwhile, to see close objects (light coming from nearby), the lens will thicken. The retina is the part of the eye is most sensitive to light, especially the part of the retina called the yellow spots. Once the retina, the light transmitted to the optic nerve. The nerves that enter cells ropes and cones in the retina, to the brain. The human eye has a perfect way of working automatically, eyes formed with 40 different main elements and these parts have an important function in the process of seeing the damage or absence of a function part of it will make impossible the eye can see. Opaque layer on the front of the eye is the cornea, iris are right behind him, in addition to members of the eye iris color can also resize automatically according to the strength of the incoming light, with the help of muscles attached to it. For example, when in the dark iris will grow to include as much light as possible. When the light power increases, the iris will shrink to reduce the light entering the eye. System auto setting that berkeja the eye works as follows. When the light of the eye is formed and nerve signals sent to the brain, to deliver a message about the presence of light, and the power of light. Then the brain sends a signal back and ordered the extent to which the muscles around the iris must shrink. Other parts of the eye that work in conjunction with this structure is the lens. The lens focuses the light entering duty eye on lining the retina at the back of the eye. Because the muscles around the lens of the light coming into the eye from different angles and different distances can always focused to retina.Semua system that we have mentioned are smaller, but far superior to mechanical equipment designed to mimic the design of the eye by using technology new, artificial image recording system even the most modern in the world was still too modest when compared to the eye. If we think about all the hard work and thought has gone into making this artificial image recording devices we will understand just how much technological superiority of the creation of the eye. If we observe the parts of a cell smaller than the eye of the wonder of creation is revealed. Suppose we are looking at a crystal bowl filled with fruit, light coming from the bowl to the eye through the cornea and iris then focused on the retina by the lens so what happens in the retina, retinal cells sehinggasel can sense the presence of light when light particles called photons of the retinal cells. When they produce a chain effect like a series of dominoes arranged in neat rows. The first domino in these cells is a molecule called 11-cis retinal. When a photon molecule changes shape about it and then push the changes of other proteins that bind strongly with the rhodopsin. Rhodopsin has now turned into a form that enables it to bind to other proteins that transducin. Transducin is already present in the cell but can not join because of non-compliance form rhodopsin. Unification is then followed by a combined one another molecule called GTP now that the two proteins rhodopsin and transducin and 1 chemical molecule called GTP has fused but the actual process has just begun compound called GDP now has a form suitable for binding one another protein called phosphodiesterase were always there in the cell. Once bonded molecular forms generated will power a mechanism that will initiate a series of chemical reactions in the cell. This mechanism produces reactions of ions in the cell and produce electricity energy energy stimulates the nerves that lie just behind the retina cells. Thus when the eye shadow that looked like a photon of light is continued on its way in the form of electrical signals. This signal contains information mata.Agar visual object outside the eye can see the electrical signals generated in the retina should be forwarded in the visual center in the brain. However, nerve cells are not in direct contact with each other there is a small gap that separates their connection points and how the electrical signal is on his way here a series of complex mechanisms occur electrical energy is converted into chemical energy without any loss of information that is being taken, and in this way the information passed from one nerve cell to the next nerve cell. Chemical carrier molecule is located at the connection point of nerve cells managed to bring information coming from the eyes from one nerve to another nerve. When it moved to the next nerve signal is converted into an electrical signal again and made his way to the other connection points in this way signals reached the visual center of the brain signal here compared the information in the central memory and the image is interpreted finally we can see the bowl Full of fruit, as we saw earlier because of the perfect system consists of hundreds of small kompenen and all this amazing series of events that occurred in less than 1 second. Myopia that someone who can not see distant objects. It usually occurs in pelajar.dapat assisted by a concave lens spectacles. Hipermetropi that are not able to see a finished object is close to the eye. May be helped by a convex lens glasses. Presbiopi is someone who can not see the object that is near or within jauh.Dapat assisted with dual monocle. Common in the elderly. Blind means that one can not see anything at all. Blindness can be caused by heredity, or accident. Myopia means that one can only see vague. People who are blind or low vision usually "read" with his fingers. It's called Braille. Color blindness is a condition where a person has no way to distinguish colors. Which can be seen only in black, gray, and white. Color blindness is usually hereditary. This means that if a person is color blind, almost certainly his son also color blind. Cataract is an eye disease in which the lens of the eye becomes opaque due to thickening of the lens eyes and occurs in the elderly (seniors).